RSA chief executive Stephen Hester has said the FTSE 100 insurer is preparing for losses of up to ?70m from the recent hurricanes in the US and the Caribbean, Storm Ophelia in Ireland, and earthquakes in Mexico. The group, which in the US and Caribbean insures businesses rather than individuals, told investors it had put aside ?50m for losses linked to hurricanes Harvey, Irma and Maria but this was likely to increase. "The range of likely outcomes is somewhere between ?40m and ?70m [for all weather events]," Mr Hester said. "We have ?40m of known losses but there are a series of uncertainties likely to add to that once losses are known. After ?70m we get protected by our reinsurance arrangements." He added that Storm Ophelia, which battered the British Isles last month, will lead to losses of around ?4m "i.e. not very much" . 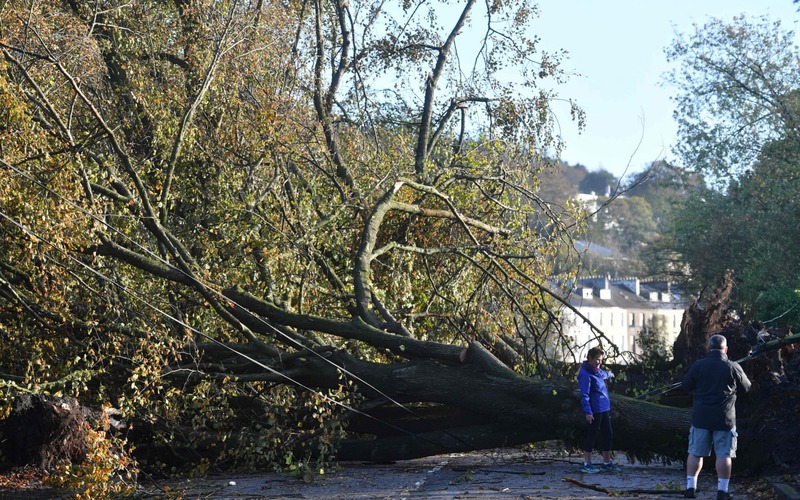 Residents look at fallen trees that were blown down by Storm Ophelia blocking a road in Irelands southwest city of Cork, on October 17, 2017. Ireland was hit by what officials called an "unprecedented storm"
Mr Hester said the insurer usually budgets around ?250m for weather events each year. As statisticians predict these extreme storms to happen only one in every 50 years, he said the losses "will have no impact on our budgets next year". The company said in a third-quarter trading update that group profits were ahead of last year although less than it had initially targeted, but did not give a figure. Shares fell on the announcement but pared back their losses to around 632p by lunchtime, virtually flat on yesterday's close. This has been one of the worst ever years for natural disasters, with London-based insurer Lancashire Holdings and the world's second largest reinsurer Swiss Re both saying on Thursday that they had swung to a loss as a result of the events. Lancashire reported a pre-tax loss of $136.4m (?104m) for the three months to September 30 after it took a $165m knock from the hurricanes and Mexico earthquakes. The news sent its shares down almost 4pc. "After many years of soft pricing conditions we are at last seeing some evidence of an increase in pricing, particularly in catastrophe exposed lines," said chief executive Alex Maloney. Swiss Re, meanwhile, reported a loss of $468m for the first nine months of the year "impacted by expected large insurance claims of $3.6bn following hurricanes Harvey, Irma, Maria, and the Mexico earthquakes". Reinsurers, which insure the insurers, are expected to be hit deepest by the losses.